Jacques Joseph Tissot (French: [tiso]; 15 October 1836 – 8 August 1902), Anglicized as James Tissot (/ˈtɪsoʊ/), was a French painter and illustrator. He was a successful painter of Paris society before moving to London in 1871. He became famous as a genre painter of fashionably dressed women shown in various scenes of everyday life. He also painted scenes and characters from the Bible. In 1856 or 1857, Tissot travelled to Paris to pursue an education in art. While staying with a friend of his mother, painter Elie Delaunay, Tissot enrolled at the Ecole des Beaux-Arts to study in the studios of Hippolyte Flandrin and Louis Lamothe. Both were successful Lyonnaise painters who moved to Paris to study under Jean-Auguste-Dominique Ingres. Lamothe provided the majority of Tissot's studio education, and the young artist studied on his own by copying works at the Louvre, as did most other artists of the time in their early years. Around this time, Tissot also made the acquaintance of the American James McNeill Whistler, and French painters Edgar Degas (who had also been a student of Lamothe and a friend of Delaunay), and Édouard Manet. 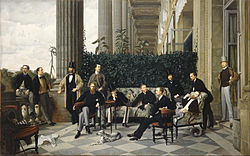 In 1859, Tissot exhibited in the Paris Salon for the first time. He showed five paintings of scenes from the Middle Ages, many depicting scenes from Goethe's Faust. These works show the influence in his work of the Belgian painter Henri Leys (Jan August Hendrik Leys), whom Tissot had met in Antwerp earlier that same year. Other influences include the works of the German painters Peter von Cornelius and Moritz Retzsch. After Tissot had first exhibited at the Salon and before he had been awarded a medal, the French government paid 5,000 francs for his depiction of The Meeting of Faust and Marguerite in 1860, with the painting being exhibited at the Salon the following year, together with a portrait and other paintings. Émile Péreire supplied Tissot's painting Walk in the Snow for the 1862 international exhibition in London; the next year three paintings by Tissot were displayed at the London gallery of Ernest Gambart. 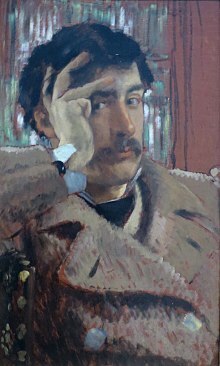 In about 1863, Tissot suddenly shifted his focus from the medieval style to the depiction of modern life through portraits. During this period, Tissot gained high critical acclaim, and quickly became a success as an artist. Like contemporaries such as Alfred Stevens and Claude Monet, Tissot also explored japonisme, including Japanese objects and costumes in his pictures and expressing style influence. 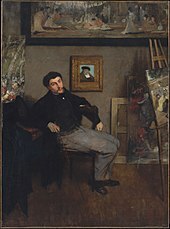 Degas painted a portrait of Tissot from these years (Metropolitan Museum of Art, New York), in which he is sitting below a Japanese screen hanging on the wall. Tissot fought in the Franco-Prussian War as part of the improvised defence of Paris, joining two companies of the Garde Nationale and later as part of the Paris Commune. His 1870 painting, La Partie Carree evoked the period of the French revolution. Either because of the radical political associations related to the Paris Commune (which he was believed to have joined mostly to protect his own belongings rather than for shared ideology), or because of better opportunities, he left Paris for London in 1871. During this period, Seymour Haden helped him to learn etching techniques. 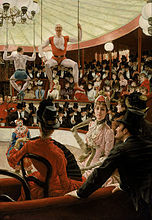 Having already worked as a caricaturist for Thomas Gibson Bowles, the owner of the magazine Vanity Fair, as well as exhibited at the Royal Academy, Tissot arrived with established social and artistic connections in London. 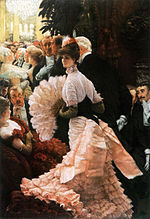 Tissot quickly developed his reputation as a painter of elegantly dressed women shown in scenes of fashionable life. 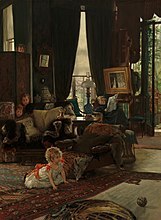 By 1872 Tissot had bought a house in St John's Wood, an area of London very popular with artists at the time. According to The Oxford Dictionary of Art and Artists, "in 1874 Edmond de Goncourt wrote sarcastically that he had 'a studio with a waiting room where, at all times, there is iced champagne at the disposal of visitors'". He gained membership of The Arts Club in 1873. 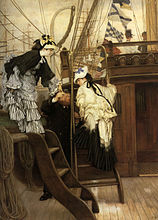 Paintings by Tissot appealed greatly to wealthy British industrialists during the second half of the 19th century. During 1872 he earned 94,515 francs, an income normally only enjoyed by those in the echelons of the upper classes. In 1874, Degas asked him to join them in the first exhibition organized by the artists who became known as the Impressionists, but Tissot refused. He continued to be close to these artists, however. Berthe Morisot visited him in London in 1874, and he travelled to Venice with Édouard Manet at about the same time. He regularly saw Whistler, who influenced Tissot's Thames river scenes. 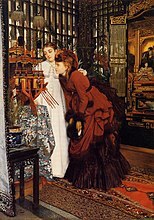 In 1875-6, Tissot met Kathleen Newton, a divorcee who became the painter's companion and frequent model. He composed an etching of her in 1876 entitled Portrait of Mrs N., more commonly titled La frileuse. She gave birth to a son, Cecil George Newton in 1876, who is believed to be Tissot's son. She moved into Tissot's household in St. John's Wood in 1876 and lived with him until her death in the late stages of consumption in 1882. Tissot frequently referred to these years with Newton as the happiest of his life, a time when he was able to live out his dream of a family life. 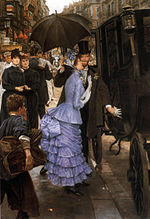 After Kathleen Newton's death, Tissot returned to Paris. A major exhibition of his work took place in 1885 at the Galerie Sedelmeyer, where he showed 15 large paintings in a series called La Femme à Paris. Unlike the genre scenes of fashionable women he painted in London, these paintings represent different types and classes of women, shown in professional and social scenes. The works also show the widespread influence of Japanese prints, as he used unexpected angles and framing from that tradition. He created a monumental context in the size of the canvases. Tissot was among many Western artists and designers influenced at the time by Japanese art, fashion and aesthetics. Tissot in 1898 (detail of a self-portrait on silk). Tissot died suddenly in Doubs, France on 8 August 1902, while living in the Château de Buillon, a former abbey which he had inherited from his father in 1888. His grave is in the chapel sited within the grounds of the chateau. 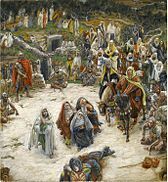 Widespread use of his illustrations in literature and slides continued after his death with The Life of Christ and The Old Testament becoming the "definitive Bible images". His images provided a foundation for contemporary films such as the design for the Ark of the Covenant in Raiders of the Lost Ark (1981) and lifestyle themes in The Age of Innocence (1993). In the first half of the 20th century, there was a re-kindling of interest in his portraits of fashionable ladies and some fifty years later, these were achieving record prices. 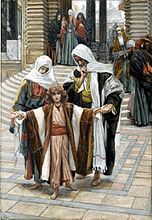 ^ "CATHOLIC ENCYCLOPEDIA: James Tissot". newadvent.org. Chisholm, Hugh, ed. (1911). "Tissot, James Joseph Jacques" . Encyclopædia Britannica. 26 (11th ed.). Cambridge University Press. pp. 1015–1016. ^ "James Tissot: Tea (1998.170) – Heilbrunn Timeline of Art History". The Metropolitan Museum of Art. ^ Roy T. Matthews; Peter Mellini (1982). In "Vanity Fair". University of California Press. p. 32. ISBN 978-0-85967-597-0. 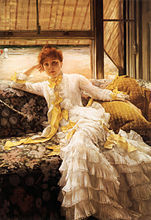 ^ 26 paintings by or after James Tissot, Art UK: see extended Oxford Dictionary of Art and Artists biography, under "artist profile"
^ "On the Thames". The Athenaeum. Retrieved 5 July 2014. ^ "Définition japonisme et traduction". Le Dictionnaire. Retrieved 5 June 2014. ^ "Japonism". Dictionary.com. Retrieved 5 June 2014. ^ Brooklyn Museum. "James Tissot". Retrieved 3 May 2011. ^ Jewish Museum. "James Tissot". Archived from the original on 18 September 2012. This article incorporates text from a publication now in the public domain: Chisholm, Hugh, ed. (1911). "Tissot, James Joseph Jacques" . Encyclopædia Britannica. 26 (11th ed.). Cambridge University Press. 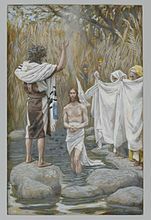 Wikimedia Commons has media related to James Tissot. Zimmer, Bill (31 October 1999). "Art; Love and History, Lavishly Elegant". New York Times. Retrieved 6 August 2008.